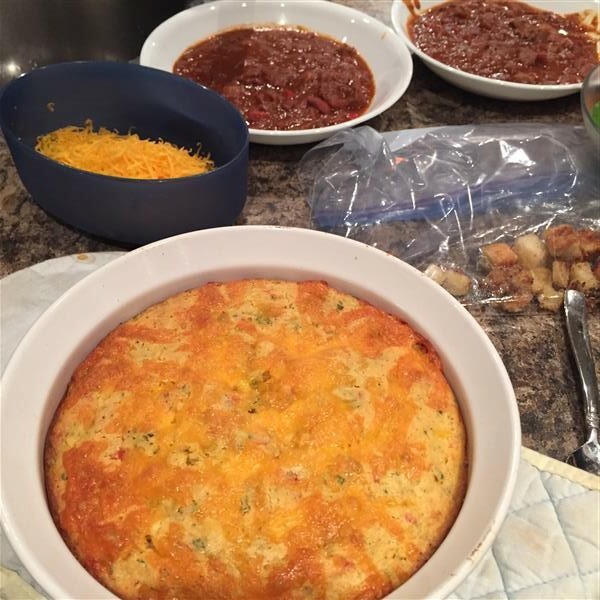 This month, in adventures in bread, it’s the turn of Southwestern “corn spoon bread”. 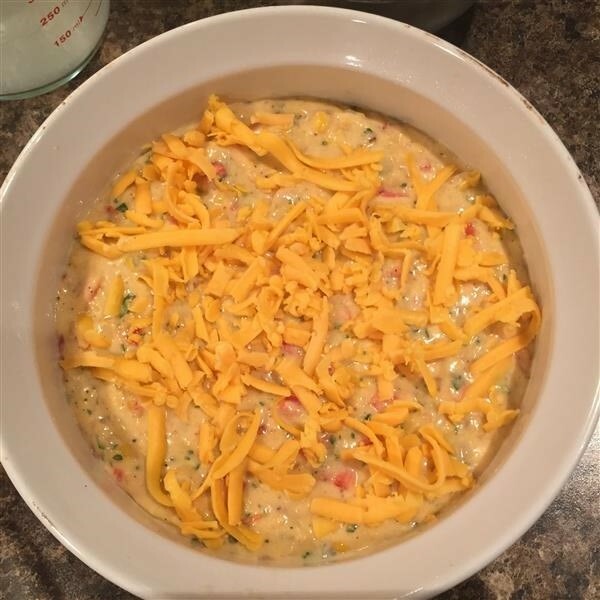 Or “southwestern corn” spoon bread? Or maybe southwestern “corn spoon” bread. Wherever you put the pause, I say it’s yummy. To be honest, this is yet another one of those recipes I wouldn’t make unless I was doing one of these bake-throughs. Mostly because I hate prepping vegetables. And fruit. But I’m much more willing to put up with it with fruit, for the sake of desserts. With this one, I started getting stuff out to make it, and discovered that, of all the things that were needed for this, I’d neglected to put onions on the grocery list, because I just assumed that we kept them in stock. Jay agreed to prep the vegetable matter and grate the cheese, if I ran out and bought a bag of onions. Works for me! I roasted and peeled the red pepper before heading out, and came home to many little bowls filled with carefully measured out and chopped ingredients. He even found some not-quite-frozen-yet cilantro in my herb bed. I fired up the stove to melt the butter, while he chopped a newly acquired onion. Then I set to sauteing onion, then added the garlic, peppers, chipotle, corn, and cilantro. Because my corn was frozen, it quickly cooled the mixture off, and I was able to move straight to the mixing. If someone else handles all the prep work, this comes together really quickly and easily. Mix wet into dry, add the veggies, whip up some egg white, fold in the egg white, fold in half the cheese, pour into a pan, then sprinkle with the rest of the cheese. Into the oven, while dinner sits patiently in the slow cooker. It took a little longer to cook than the recipe called for, but not by a lot. This was the perfect accompaniment to the chili that spent all day on Sunday in the slow cooker, while we went out to Huron County to visit my Grandma. It didn’t take a huge amount of time to put together, either. Most of my time was spent going out for onions. 😉 I’m definitely glad I signed up for this bake-through, because I’m slowly adding some savoury skills to my repertoire, and that can only be a good thing. Even if my husband’s willing to cook all the meals, he probably shouldn’t have to. 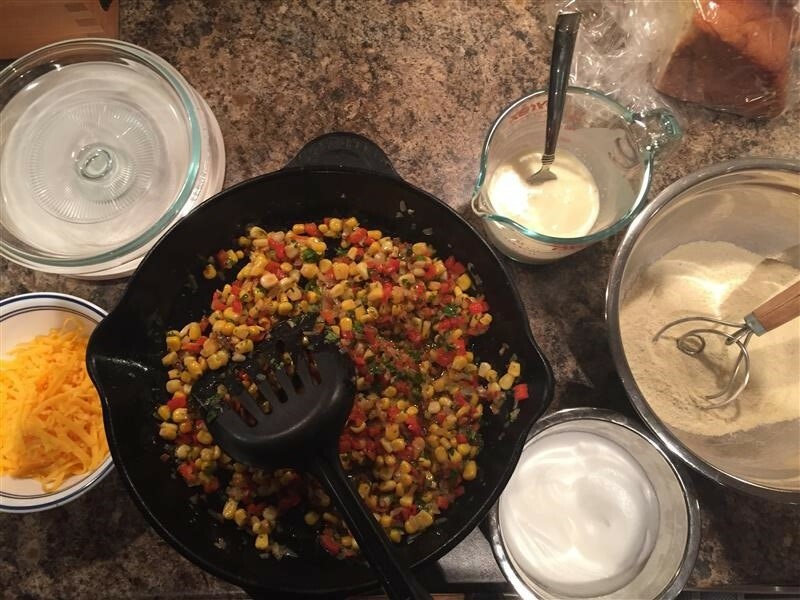 Posted on November 12, 2015 November 12, 2015 by KristinaPosted in The Bread BibleTagged savory, spoon bread. Great to have a sous chef husband! Your spoon bread turned out great. Good idea to throw some chili in the slow cooker. Perfect entre to go with this bread. Bet your grandma enjoyed your company. Winter certainly seems to have roared in with very little autumn this year, at least out west. How great to have someone to prep everything. Does Jay clean up too? I loved this bread and like you would never have tried it without the Alpha Bakers. He often does, actually. I’m pretty spoiled.